Back home there was a suburb of Sydney that was home to several Lebanese pastry shops. They sold sweets like baklava, halva, and all sorts of exotic middle eastern delicacies. We used to take a 40 minute drive just to have coffee and sweets there, or buy a plate to bring to a dinner party. The main difference in Britain is that most suburbs outside of London do not have the demand and hence the supply for this sort of thing, and I’ll be darned if I’m driving into Edgeware Rd to get my baklava fix. Funny how I don’t drive the distances I used to for such trivial reasons now that I live in Britain. I wouldn’t dream of driving an hour to a restaurant, even though I used to back home. I think it’s because there’s a more heterogenous suburban life in Sydney. There are suburbs where you can go for good Portuguese, or Vietnamese, or Italian, or Lebanese and so on. But of course that kind of eclectic cultural mix is the result of vigorous immigration policies over the last century, that has seen people from all over the world come to find their dream in the biggest cities of Sydney and Melbourne which now proliferate with a global cuisine culture of unparalleled richness and variety. 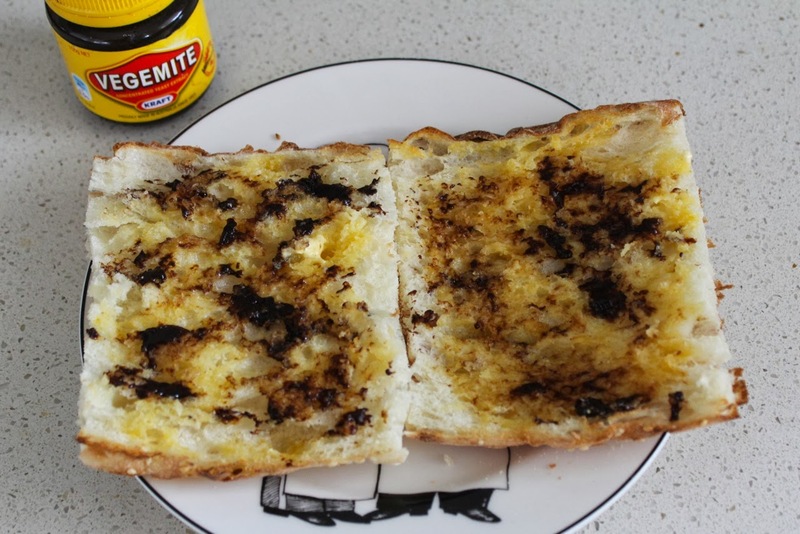 I have missed the Thai and Lebanese food the most, and little things like toasted Vegemite Turkish pide, where butter would pool in the holes. I miss being able to get good, cheap Asian food mainly Thai and Vietnamese. I went to The Giggling Squid in Marlow this week and it was great. The food was very good, and rich in flavour and fragrance and it was just wonderful to enjoy Thai cuisine again. But it was a fine dining establishment, with small serves, napkins and water glasses and finesse like this costs money. I’d love to see Thai food cooked up fresh, and served take-away for a fraction of the cost of the fine Thai dining that seems to be the only choice here in Berkshire. I’d love to see a Lebanese pastry shop open on the Cookham High St. But until this day comes, it’s up to me to satisfy my cravings for global cuisine. Yesterday my mum came for lunch. I don’t like to entertain, and I think it comes down to my pride and anxiety about making a mistake. But there’s no one more worthy of my time and effort and more understanding of my anxiety to succeed than my mum. (Hi Mum!). I’ll be sharing the recipes from our spiced feast of culinary exotica over the coming weeks. I took some risks, tried new things and flew by the seat of my pants. I’ll start with the thing I made last, the thing I made only hours before she was due because I was concerned that the cake I’d made was not a shining success (see the anxiety?). The thing I made was a Lebanese pastry called znoud el sett – which translates as ‘lady’s arms’. 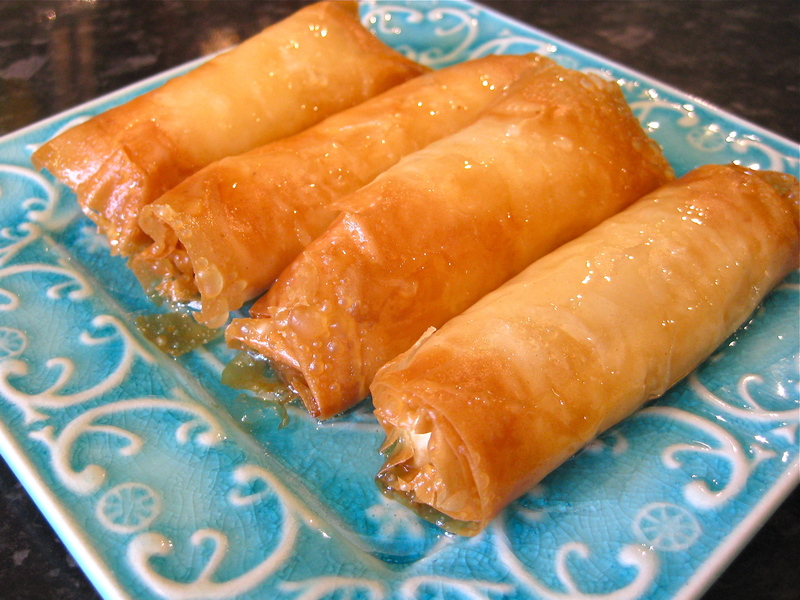 Sort of like sweet spring rolls, in my research I discovered that these delicacies can be filled in a variety of ways. The ‘cream’ used in the centre can be anything from Lebanese clotted cream called kachta to a creamy bread-soaked filling called ashta. They can also be fried or baked but they’re always soaked in some sort of fragranced sugar syrup. I made mine with left-over cuts of filo pastry that I had from the savoury carrot baklava, a tub of ricotta and orange blossom sugar syrup. The results were amazingly similar to my experience back home in Sydney, and surprisingly easy to make. Using ricotta was a risk, as I’d never made these before, but it turned out beautifully and the slight savoury quality of the cheese was delicious against the crisp, sweet syrup-soaked pastry. I fried mine, but I would guess that you could get similar results from baking. You could probably also marscapone cheese but it might need to be hung to separate out some of the liquid. Don’t mix the separated ricotta when you go to use it – try and leave the cheese separated and slightly harder. 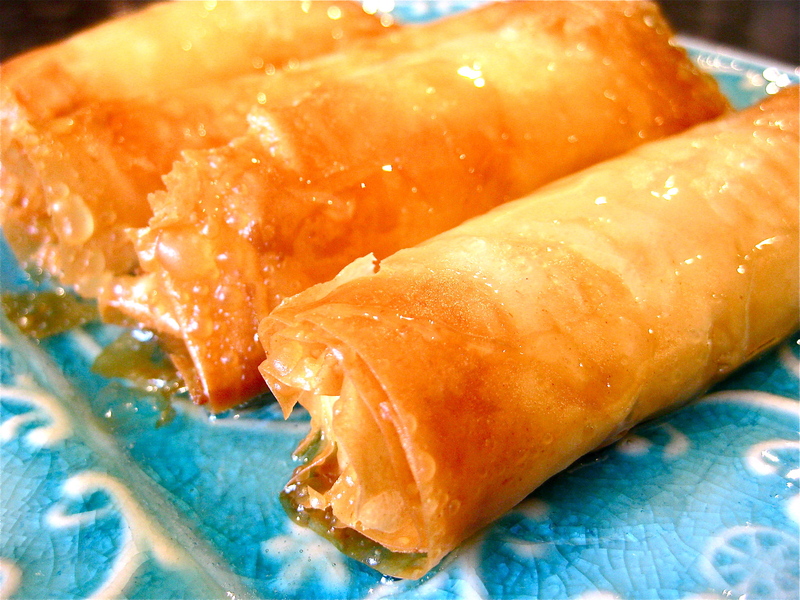 Place 2 pieces of filo about 12cm wide to form a cross shape. Brush with melted butter and place a heaped tablespoon of ricotta in the middle. Fold the bottom flap up and over the lump of cheese, followed by the right hand flap, then roll once, then fold over the left hand flap, effectively enclosing the cheese in a little parcel. Brush a little more butter on and roll it up to form something like a spring roll. Make as many as you like, and fry about 3 at a time, no more. Fry until they’re deeply golden brown, as you risk the pastry in the centre not cooking. It’s one of those rare instances where it’s better to over do it than under do it. Put the sugar and water in a small pot and bring to the boil. Simmer for about 7-10 minutes for this quantity. If you have a thermometer go to 200C. Take off the heat, wait till it stops boiling and stir in lemon juice and orange blossom water. Then pour over the still hot pastries. Abla’s being one, by any chance? My local international store (Wallington) has ladies arms, and all sorts of other interesting bits and pieces. Ridiculous to be quite as excited as I am by this, but Abla’s was just up the road from me in Sydney, and I’ve missed being able to just trundle up the street for this sort of thing. It was indeed Abla’s and there are a couple of other Lebanese sweet shops we used to visit in Guildford/Rosehill. I also miss the variety and authenticity of global cuisine! Edgeware Rd in London is pretty great for food from the middle east. Lots of great falafel, hummous, sweets etc. We go there for our falafel fix.